Sabres time is coming, it just isn't now - The Point Data-driven hockey storytelling that gets right to the point. Just over a month ago, the Buffalo Sabres were the toast of the NHL. First place in the Atlantic division and winners of ten straight games, the Sabres had many believing they were a playoff lock. Today, they are clinging to their playoff lives, two points up on the 9th place Islanders who have two games in hand. The reality is, this isn’t the collapse of an above average team, it’s the regression of an average team with a bright future – future being the operative word. Almost every 10-game win streak, in any sport, is a bubble to some degree. The Sabres win streak happened to be a 2008 housing market-esque bubble. According to our expected goals model, the Sabres should have won 3 of the 10 games played in that stretch. They won all of them. Hats off to the team for winning those games – no one can take that away from them but it’s important to remember the outlier was the 10-game win streak, not their subsequent 4-7-4 record. 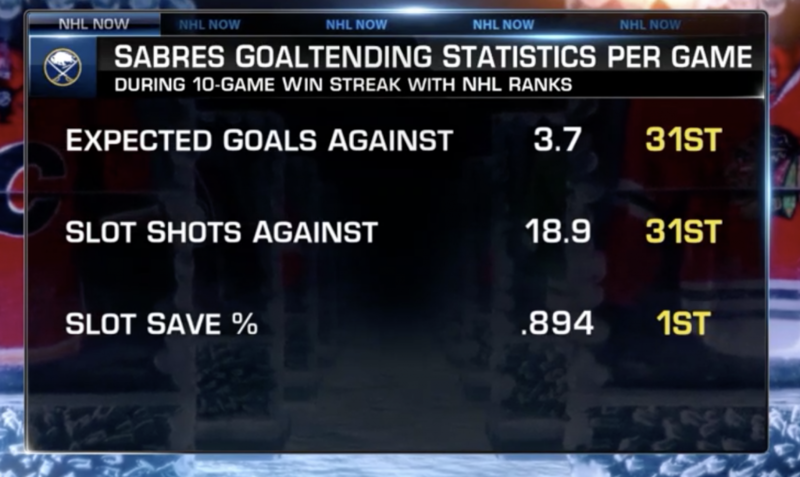 On November 27th, after Buffalo had won its 10th straight game I spoke on NHL Network about how unlikely the streak was based on the league-high amount of chances it was allowing during that stretch and used this graphic to articulate that point. Carter Hutton and Linus Ullmark were fantastic and, more than anything other factor, responsible for a number of wins during the streak. Not surprisingly, they weren’t able to sustain that level of play and the Sabres stopped winning games at a high-rate which, is one reason the Sabres have come crashing back down to Earth. The other, a severe lack of production from everyone other than Jack Eichel, Sam Reinhart and Jeff Skinner. 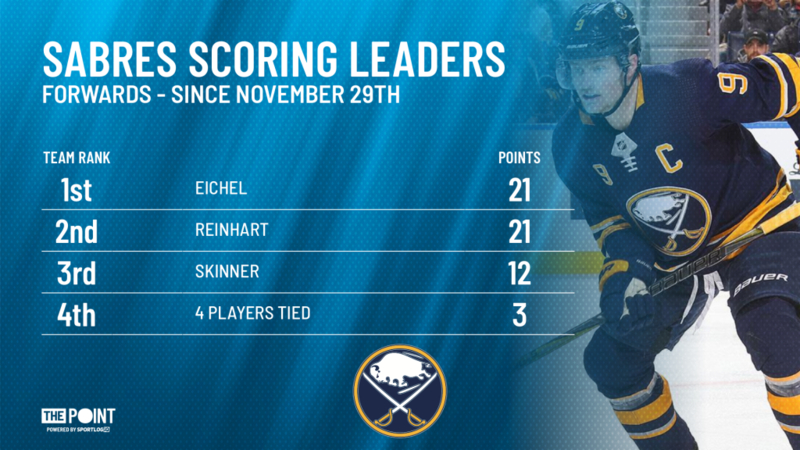 Since the 10-game win streak ended, the Sabres top line has combined for 22 goals – the rest of their most used forwards, 10. In fact, no Sabres forward, other than the three I mentioned, has more than 3 points in the 15 games since the winning streak ended. Yes, you read that correctly. Secondary scoring has been almost non-existent in the Sabres last 15 games. The other team right behind the Sabres in the standings is the Montreal Canadiens. At the start of the season, I predicted the Canadiens to finish higher in the standings than the Sabres. 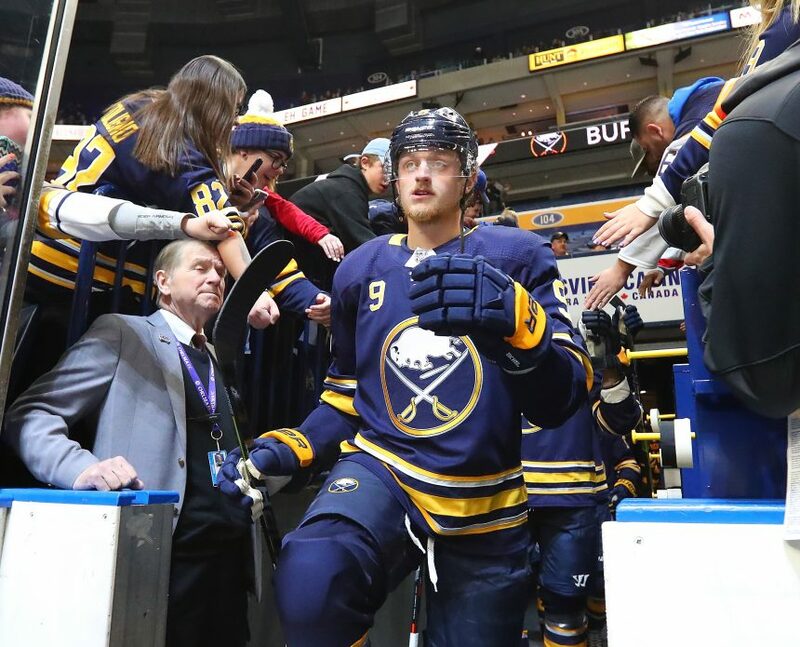 I doubled down on that prediction on a Buffalo radio station in late October, citing depth as the main reason and let’s just say, Sabres fans weren’t too happy about it. The mentions were fire that day:) But, what I believed would happen, has happened. The Canadiens are one of only two teams with 10 or more players averaging at least half a point per game. The other, the Tampa Bay Lightning. 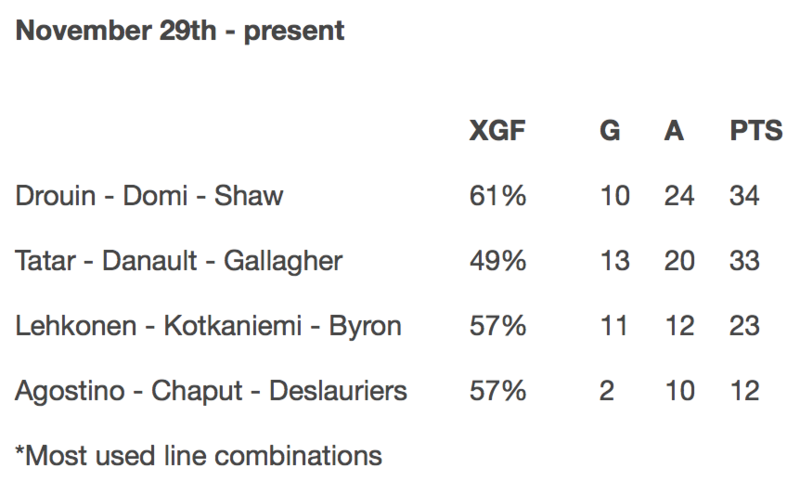 Here’s a breakdown of the Canadiens production, by line, in the same time frame as the Sabres shown above. That’s depth. The Canadiens get scoring up and down their line-up. That’s why I picked them to finish ahead of Buffalo at the start of the season. That’s why I haven’t changed my mind. 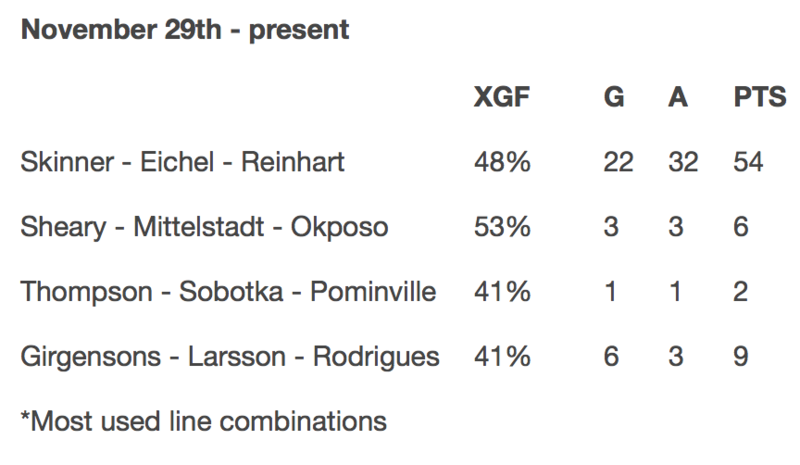 Yes, Buffalo has more top-end talent than Montreal and, I would argue, is better positioned for success in the future. But, like I said – future is the operative word. There’s still half a season left and it’s entirely possible the Sabres finish ahead of the Canadiens in the standings but don’t be surprised if they finish below them and out of a playoff spot. Most level headed Sabres fans I’ve heard from know it isn’t the end of the world if their team doesn’t make the playoffs this season. It’s easy for some to forget, the Sabres were the worst team in the league last year. What made their run in November such a great story is that it wasn’t a top-tier team doing it. It was the reigning 31st place team, winning 7 of those 10 games in extra time, finding a way to overcome the odds to win every game despite the fact that they should have lost 70% of the games they played during that stretch. The Sabres have a bright future and one of the most passionate fanbases in the NHL. It won’t be long before Buffalo is a real threat in the Atlantic division. I just don’t expect it to happen this season.